March 2, 2015|Posted in: Happy, Healthy, Smart Kids! Long before your baby is even born she will hear and recognize the sound of her mother’s voice. A newborn baby is comforted by the familiar sounds of its parent’s voices just minutes after birth. Babies whose parents talk to them often will usually learn to talk sooner and be more verbal than babies who aren’t talked to as much. My children and grandchildren are evidence to that fact. When I took my one year old daughter to the doctor for a well baby check he asked me if she knew how to say five words. I proudly told him it was more like fifty words. At two years old my grandson used words like, “otherwise and actually.” Even toys that talk to baby help them learn language. Another grandson learned his letters all on his own at two years old by playing with a child’s electronic tablet. 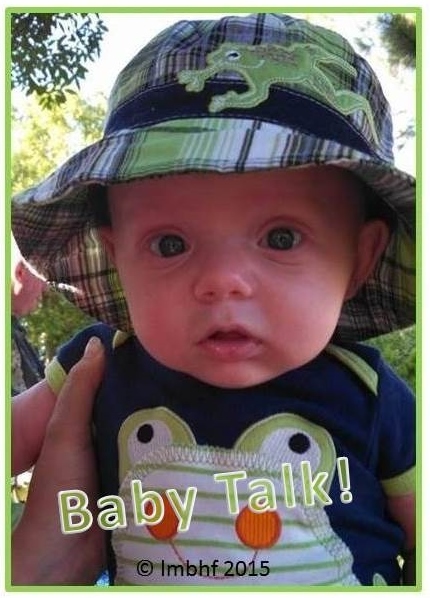 So talk to your baby abundantly and surround him with language from the moment he is born (and even before)! Ask Questions and talk to Baby about His Emotions Ask him questions like, “Why are you crying? Are you hungry?” or “Are you tired?” Do you want to go night-night?” Of course your baby won’t answer your questions. But he will learn to recognize the words that describe how he’s feeling. He will also sense that you care about his feelings and it will help him develop a sense of security. Tell baby about how you’re feeling. “Your smiles make Mommy happy!” “Daddy is feeling too tired to play right now.” Explain how others are feeling, “That baby is crying because he wants the toy.” This will lay a foundation for helping your baby to learn empathy. Talk to Baby about What You are Doing. Tell her, “Mommy is helping brother put his shoes on” or “Daddy will get you a baba.” Also, name things for baby such as “nose, eyes, rattle, diaper, grandma.” Doing this will help your baby recognize the words that label people, objects and actions. Sing Songs, Play Games, Laugh and Be Silly. Your baby will love it when you sing to him, whether it’s lullabies like Rock a Bye Baby or the Top Forty! Play Peek a Boo, This Little Piggy, and Pat-a-Cake! Laugh, pull faces and make raspberries! All of these things help you bond with baby and the help him develop language. Praise Baby, Encourage Her and Tell Her You Love Her. Don’t just express your love for your baby with hugs and kisses. Let them hear you say the words, often! Tell her when she does a good job. Express to her in words that you are proud of her and you believe she can learn and do new things. Explain Things to Baby and Give Him Simple Instructions. Tell baby why he must have vaccinations or why he must wait until you pay for it to open the toy. He won’t understand your words but he will be comforted by your tone of voice. Don’t worry about using words your baby doesn’t understand. Hearing those words is how they learn to understand them. And it’s ok to talk about things they haven’t yet learned about. All of these things will help baby learn language. So talk to your baby all the time and about all kinds of things. Speak clearly and use short simple sentences. Name objects, actions and feelings for baby. All of this will help you and your baby become closer. Surround your baby in an enviornment rich in language and verbal stimulation. That is the very best way to help her to develop language so she can communicate with you sooner! Here are related products you might be interested in. Click on the photo or description to be redirected to Amazon where you can purchase the products. This is so true! Just this morning my 9 month old son was crying, I said “Are you hungry?” And he stopped crying and looked up at me, then I gave him breakfast! Great suggestions for all our daughters and daughter in laws who might be expecting. Thanks for linking up with Blogging Grandmothers. Love this post! I talked to my kids and grandbabies all the time. Singing songs, reading to them, constant interactions is what they need. Sad to say though, so many babies, toddlers, and children don’t get this kind of special attention 🙁 Thanks Lori from Grammy Dee, #BloggingGrandmothers #LinkUp #BlogParty, social media shared. Oh, one more thing – Cute, precious baby! Is he your grandbaby?